This heart-shaped throw is perfect for giving to someone you love. Make it for your own bed or sofa in these warm-hearted colors or choose other colors that make you feel good. 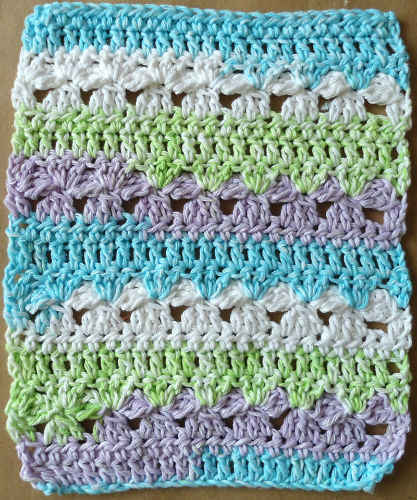 GAUGE: 12 sts = 4″; 7 rows = 4″ in double crochet. CHECK YOUR GAUGE. Use any size hook to obtain the gauge. 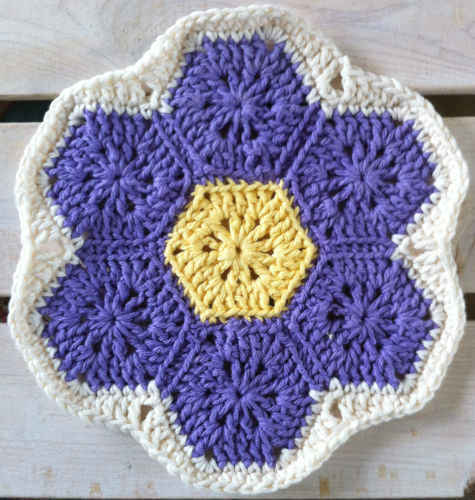 Throw measures 52½” tall (measured from lowest point to top) x 60” wide (at widest). Round 1 (Right Side): Ch 4 (counts as first tr), (7 dc, hdc, ch 1, hdc, 7 dc, tr); join with slip st in top of beginning ch- 4—18 sts and 1 ch-1 space. Round 2: Ch 3 (counts as first dc), [2 dc in next dc, dc in next dc] twice, (dc, tr) in next dc, 2 tr in next dc, (tr, dc) in next dc, hdc in next hdc, sk next ch-1 space, hdc in next hdc, (dc, tr) in next dc, 2 tr in next dc, (tr, dc) in next dc, [dc in next dc, 2 dc in next dc] twice, tr in next tr, tr in space between last tr and beginning ch of Round 1; join with slip st in top of beginning ch-3—29 sts. Round 3: Ch 2 (counts as first hdc), hdc in next 3 dc, dc in next 2 dc, 2 dc in next 3 sts, (dc, tr) in next tr, 2 tr in next 2 tr, (dc, hdc) in next dc, sc in next 2 hdc, (hdc, dc) in next dc, 2 tr in next 2 tr, (tr, dc) in next tr, 2 dc in next 3 sts, dc in next 2 dc, hdc in next 4 sts, (hdc, dc, hdc) in last tr; join with slip st in top of beginning ch-2—45 sts. Fasten off. With Right Side of center heart facing, join C in space between 2 sc of Round 3 (at top of heart). Round 1 (Right Side): Ch 3 (counts as first dc), skip first sc, skip next hdc, skip next dc, hdc in next tr, *ch 1, hdc in next st; repeat from * around to last tr, ch 1, hdc in last tr, skip last 3 sts, dc in space between last sc and first sc, ch 1; join with slip st in top of beginning ch-3—39 ch-1 spaces. Round 2: Ch 4 (counts as dc, ch 1), *[hdc in next ch-1 space, ch 1] 7 times, [sc in next ch-1 space, ch 1] 3 times, [hdc in next ch-1 space, ch 1] 3 times, [dc in next ch-1 space, ch 1] 3 times, [hdc in next ch-1 space, ch 1] 6 times, [dc in next ch-1 space, ch 1] 3 times, [hdc in next ch-1 space, ch 1] 3 times, [sc in next ch-1 space, ch 1] 3 times, [hdc in next ch-1 space, ch 1] 7 times, skip next hdc, dc in last dc, ch 1; join with slip st in 2nd ch of beginning ch-3—40 ch-1 spaces. Round 3: Slip st into first ch-1 space, ch 3 (counts as hdc, ch 1), [hdc in next ch-1 space, ch 1] 3 times, (2 dc, ch 2, 2 dc) in next ch-1 space (corner made), ch 1, [hdc in next ch-1 space, ch 1] 3 times, [sc in next ch-1 space, ch 1] 3 times, hdc in next ch-1 space, ch 1, [dc in next ch-1 space, ch 1] twice, (2 dc, ch 2, 2 dc) in next ch-1 space, ch 1, [dc in next ch-1 space, ch 1] twice, hdc in next ch-1 space, ch 1, [sc in next ch-1 space, ch 1] 3 times, hdc in next ch-1 space, ch 1, [dc in next ch-1 space, ch 1] twice, (2 dc, ch 2, 2 dc) in next ch-1 space, ch 1, [dc in next ch-1 space, ch 1] twice, hdc in next ch-1 space, ch 1, [sc in next ch-1 space, ch 1] 3 times, [hdc in next ch-1 space, ch 1] 3 times, (2 dc, ch 2, 2 dc) in next ch-1 space, ch 1, [hdc in next ch-1 space, ch 1] 5 times; join with slip st in 2nd ch of beginning ch-3—4 corners, with 9 sts and 10 ch-1 spaces between corners. Fasten off. Final Round: Join A in any corner ch-2 space, ch 3 (counts as first dc), hdc in same ch-2 space, *skip next corner dc, hdc in next corner dc, hdc in next ch-1 space, [ch 1, hdc in next ch-1 space] 9 times, hdc in first dc of corner, skip next dc of corner, (hdc, dc, ch 2, dc, hdc) in corner ch-2 space; repeat from * 2 more times, skip next dc of corner, hdc in next dc of corner, hdc in next ch-1 space, [ch 1, hdc in next ch-1 space] 9 times, hdc in first dc of corner, skip next dc of corner, (hdc, dc) in first ch-1 space, ch 2; join with slip st in top of beginning ch-3. Fasten off, leaving a 20” tail for sewing. Make same as Heart Square #1, using A for center heart, B for mesh around heart, and E for Final Round. Make same as Heart Square #1, using B for center heart, A for mesh around heart, and E for Final Round. With A, ch 5; join with slip st in first ch to form a ring. Row 1: Ch 3 (counts as first dc here and throughout), work 9 dc in ring; do not join, turn—10 dc. Row 2: Ch 3, 2 dc in space between first and 2nd dc, [dc in next space between sts] twice, [2 dc in next space between sts] twice (corner made), [dc in next space between sts] twice, 2 dc in next space between sts, dc in top of beginning ch, turn—14 sts. Rows 3–7: Ch 3, 2 dc in space between first and 2nd dc, dc in each space between sts across to first 2-dc group at corner, 2 dc in next space between sts (space between 2 sts of first 2-dc group), 2 dc in next space between sts (space between the two 2-dc groups at corner), dc in each space between sts across to last 2-dc group, 2 dc in space between sts of last 2-dc group, dc in top of turning ch, turn—34 sts at the end of Row 7. Row 8: Ch 3, 2 dc in space between first and 2nd dc, dc in each space between sts across to first 2-dc group at corner, 2 dc in next space between sts (space between 2 sts of first 2-dc group), ch 2, skip next space between sts, 2 dc in next space between sts (space between 2 sts of next 2-dc group), dc in each space between sts across to last 2-dc group, 2 dc in space between sts of last 2-dc group, dc in top of turning ch, turn—38 sts and 1 ch-2 space. Fasten off, leaving a 20” tail for sewing. With E, make same as Triangle #1. With B, make same as Triangle #1. With C, make same as Triangle #1. 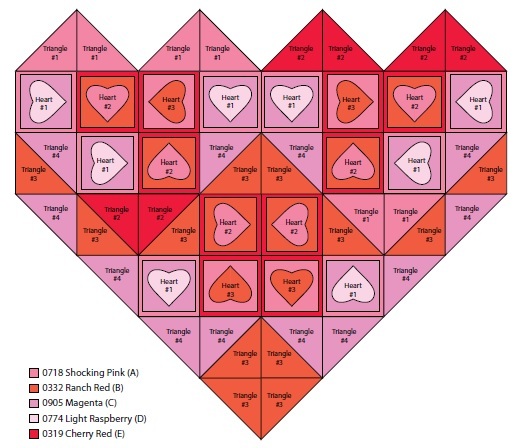 Arrange Hearts and Triangles with Right Sides facing, as shown in assembly diagram. Using long yarn tails and working through back loops only, whipstitch pieces together, skipping sts as needed to allow seams to lie flat. Weave in ends. Round 1 (Right Side): With Right Side facing, join C in lower point of heart, ch 1, work sc evenly spaced around edges of entire piece; join with slip st in first sc. Note: For best results, work an even number of sts. Round 2: *Ch 3, skip next sc, sc in next sc; repeat from * around; join with slip st in base of beginning ch-3. Fasten off. Note: When working Rounds 3 and 4, skip an additional ch-space in the valleys between the tops of hearts at top of throw, to allow edging to lie flat. Round 3 (Right Side): With Right Side facing, join A in any ch-3 space, *ch 4, drop loop from hook, insert hook from front to back through next ch-3 space, place loop back on hook and draw through to front; repeat from * around; join with slip st in base of first ch-4. Fasten off. Round 4 (Right Side): With Right Side facing, join B in any ch-4 space, *ch 3, drop loop from hook, insert hook from front to back through next ch-4 space, place loop back on hook and draw through to front; repeat from * around; join with slip st in base of first ch-3. Fasten off. Weave in ends. Block lightly, if desired. 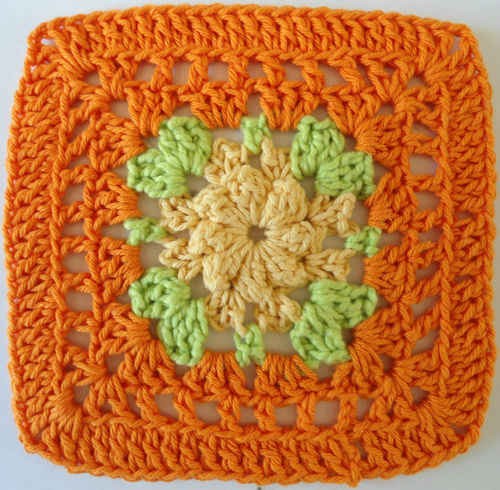 ABBREVIATIONS: A, B, C, D, and E = Color A, B, C, D, and E; ch = chain; dc = double crochet; hdc = half double crochet; sc = single crochet; sl st = slip stitch; st(s) = stitch(es); * = repeat whatever follows the * as indicated; [ ] = work directions in brackets the number of times specified; ( ) = work directions in parentheses into same st.